LDN DAILY SUDOKU You need Java enabled to view the crossword applet. complete the puzzle. Good luck! row must also contain the numbers 1-9 with no duplications or missing numbers. numbers 1-9. There is only one solution for each puzzle. 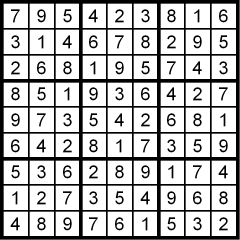 Note: if the LDN Daily Sudoku puzzle does not appear in your browser window, you may need to install Java. Click here to go to the Sun Java site.